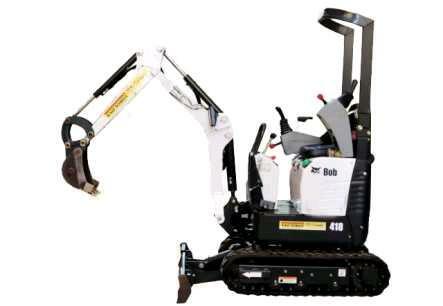 The BOBCAT 418 Compact Excavator is great for accessing space restricted areas. It can narrow its track width to less than 29" to transport then expand to 43" for stable digging. A hydraulic breaker is also available for concrete demolition. CAB HEIGHT 87" ENGINE 10.2 HP DIESEL FUEL TANK CAP. 7.3 GAL. * Please call us for any questions on our excavator 2 500lb bobcat 418 rentals in Portland OR, Gresham OR, Milwaukee OR, and surrounding metro area.